Blanch the potato slices in boiling water for two minutes and drain. Heat the oven to 200c. Heat the olive oil in a large pan and gently sauté the onions, mushrooms and garlic until soft. Add the beef and brown, seasoning with salt and pepper. Add the tinned tomatoes, cinnamon, allspice and tomato purée and simmer for ten minutes. Make the bechamel by melting the butter in a pan on a medium heat and whisking in the flour. Slowly add the milk, whisking all the time. Season well, add the bay leaf and nutmeg and cook for a couple of minutes until thickening. 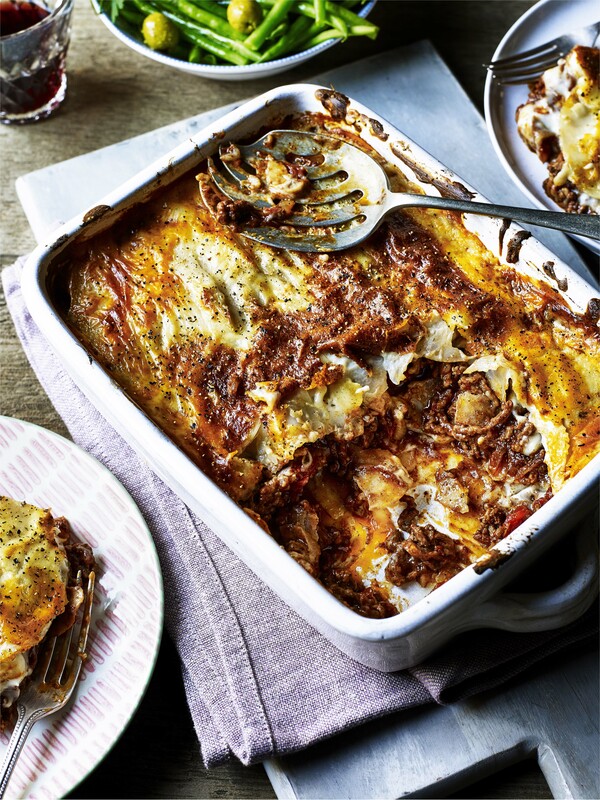 Layer the bottom of a 25x16cm lasagne dish with some of the sliced potatoes and add some of the beef mix. Spoon over some bechamel and top with another layer of potatoes. Repeat and finish with the bechamel sauce and some freshly ground black pepper. Cook in the oven for 30 minutes, until golden and serve with garlic green beans or salad.